What is "Firmware Cache"? Why do you need to save this? 1. 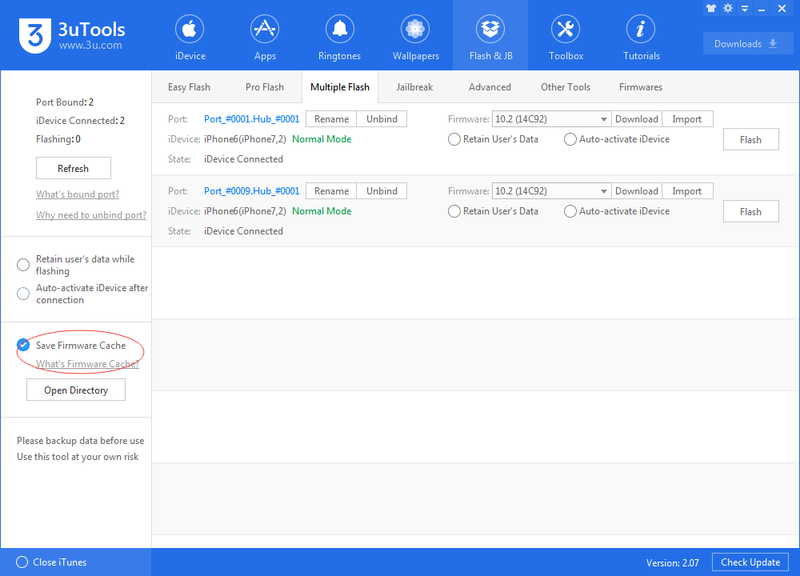 3uTools needs to extract firmware file in every flash process. 2. If you have saved the firmware file, users no need to extract it again when they flash the same firmware at the next time. 3. If you want to view or delete firmware file, please click “Open Directory” in 3uTools. “iDevice is Connected, But Can’t be Recognized” While Using 3uTools? How to Solve the Frequent Operational Failure of 3uTools on Computer? How to Fix Cannot Import Photos to the Camera Roll? 3uTools Frequently Prompts “Connection Timeout”? How to Download and Set Ringtone Using 3uTools? How to Use Back up and Restore in 3uTools? Failed to Export Photos Using 3uTools? How to Turn Off iOS Software Update Notifications Reminders?